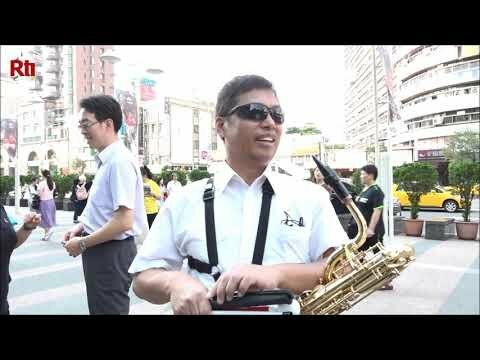 A group of visually impaired musicians at the Eden Social Welfare Foundation decided to do a flash performance on the streets of Taipei this week. They’re called the Eden Happy Blind Band. As a preview to an upcoming concert, they performed in the streets of Taipei. They said, "Hi everyone. We’re the Eden Happy Blind Band. We’re happy to share our music with you. We all aborigines and we’re going to sing a Thao tribe song called Happy Gathering. We hope you like it. Are there any people out there? If there are, clap your hands! We can’t see…Wow, there must be 200 of you! Hahaha..."
One of the performers is from Taitung’s Puyuma tribe. He was born with retinopathy and after a cycling accident his eyesight worsened to the point where he went blind at age 17. He was depressed, but 13 years ago, he rediscovered his love for music and joined the Eden Happy Blind Band. He says, "We share our music with everyone and some of our life experience as well. We also want people to know that the physically challenged in the 21st century are different than in the past more insular society. We’re really different!" The Eden Happy Blind Band has been performing throughout the world for 33 years. They do so to bring hope not only to themselves but to society. Lee Hsi Wu, the head of the band’s media department says, "The visually impaired have lost the function of their eyes but we have no limits to our potential in the performing arts." The Eden Happy Blind Band will perform at Taipei’s Armed Forces Cultural Center on December 1.